17-Mar-2017 -- While on a long drive from South Lake Tahoe to Las Vegas, I decided to revisit two Degree Confluence Points - 39N 119W and 38N 118W - that I had first visited in 2006. I had visited each of these points in the late afternoon, close to sunset, so I was curious to get another view of these points during the middle of the day - and also to get aerial views of the point using my remote-controlled quadcopter. As before, to reach this point, I took a dirt road South from highway "Alt US 95" - at almost exactly 119W longitude. This road passes 0.6 miles to the East of the confluence point, leading to an easy hike across undulating desert terrain. The point lies near the top of a sandy ridge. 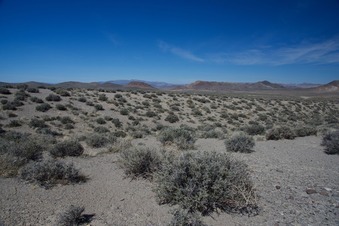 Like so many of Nevada’s Degree Confluence Points, little is growing here except sagebrush.